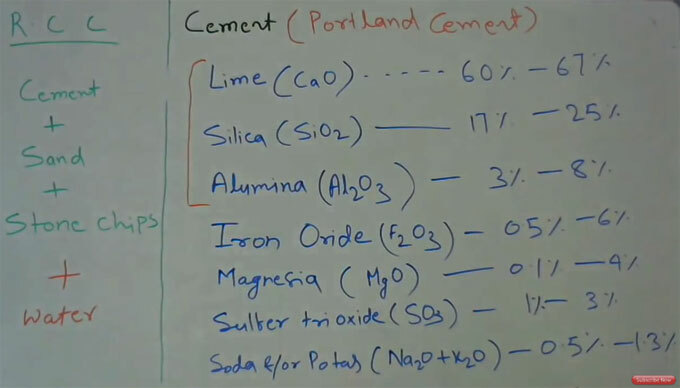 This construction video tutorial provides brief explanation on reinforcement cement concrete as well as the basic process for manufacturing cement and its various raw constituents and the proportion of water & cement in concrete. Reinforced cement concrete is formed by mixing cement, sand, stone chips and water. The mixing is kept for 28 days. To produce cement, 1/3 of argillaceous material is mixed with 2/3 of calcareous material. Argillaceous material contains silica, alumina and oxides of iron. Clay and shale belongs to common argillaceous materials which are utilized as cement ingredients for manufacturing cement. The general calcareous raw materials belong to limestone and chalk, but others materials like coral or shell deposits, are also utilized. Clays, shales, slates, and estuarine muds are the common argillaceous raw materials. All the above mentioned materials are crushed into a ball mill in dry or wet condition. Under dry condition power is produced and wet condition slurry is produced. To learn the detailed process, watch the following video.